HP's ProBook range aims to serve business users without breaking the bank. The ProBook 4510s offers a variety of speciﬁcations, to cater for all budgets and requirements and proves to be a semi-portable choice. The 15.6-inch TFT screen features a widescreen 16:9 aspect ratio, making the laptop ideal for watching DVDs on. It boasts LED technology which provides a bright picture with great colour reproduction and which is also less resource intensive on the battery. As with most business laptops, there's no shiny Super-TFT screen coating, meaning we weren't plagued by irritating reﬂections in bright or fast-changing light, such as when working on the train. In a bid to add a prestigious air to the laptop, a shiny lid has been used to protect the screen. While it does look good, it is a magnet for ﬁngerprints, dust and grime. The machine's chassis is constructed from a matt plastic, which is reasonably solid and should prove durable enough for frequent use on the daily commute. The keyboard is one of the ProBook's strengths. While it does ﬂex slightly in the middle, the cut-out-key Isolation style makes for a good typing action. There's even room for a dedicated numeric keypad for those who regularly input data. Our pre-production unit was powered by an Intel 2GHz Core 2 Duo processor with 2048MB of memory and we found that it ran basic ofﬁce applications smoothly. While none of the ﬁnal production models feature this exact speciﬁcation, the sixteen available models of the 4510s range cater for a broad variety of business users and offer various models of Intel dual-core processors, as well as assorted memory options – so you should easily ﬁnd a speciﬁcation to ﬁt your needs. The laptop's Tri-Format DVD writer features LightScribe technology, enabling you to burn labels on to the surface of your DVDs, making them easier to ﬁle. Blu-ray drives are also available on some models. The laptop is well catered for when it comes to connectivity, with four USB ports for connecting peripherals such as smartphones or external mice, VGA and HDMI outs for connecting analogue and high-deﬁnition (HD) external monitors, and a memory card reader and ExpressCard slot are also included. All models feature built in Wi-Fi for wireless connectivity, with Bluetooth rounding off the speciﬁcation. 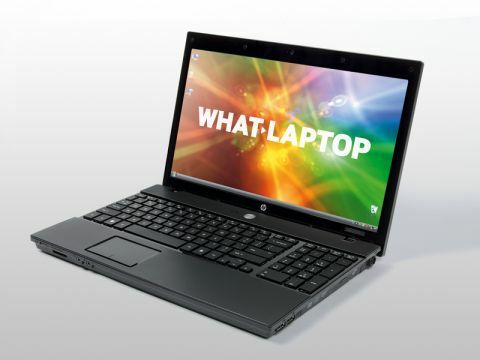 While we weren't fully blown away by the HP ProBook 4510s, we were very impressed by the laptop's great usability. And, with models starting at prices as low as £320, the commendably affordable price makes it great for small businesses and home ofﬁce use.